What holes do I need to use on the original rear hubs (tkr5040) to achieve the same effect as the .3 rear hubs (tkr5199)? Just from the pictures, the holes seem to be in different locations. My NT48 is giving me a problem when I got it on a starter box and turn the wheels left or right not even all the way to the lock. If the wheels are not turning and you slowly apply throttle it has a violent shake in the front. This is a brand new kit never been ran. Makes you think the front axle drive pins are to long binding on the arms at the out drives but it has tons of clearance. Or like the front drive line coupling is hitting Ackerman plate and it has good clearance. Tires are balanced. Once it gets to a higher spinning speed it smooths up and you can turn it to full lock in either direction and as long as you don't stop the wheels it is smooth. I have been through this thing like crazy and can not see any thing rubbing any where. Jeff, I had the same problem, it is caused by the screw which mounts the steering link to the steering knuckle, it's a bit long and hits the arm at full droop. Just add 1-2 extra washers on top of the 4 you used when you built it and the problem is solved. Sent a vid to Tekno and was told buy the person on the phone it was normal and he said the ownner even said it was normal. Wish i was smart enough to post the video i sent to them. Said it was cvd bind at full lock and i had the EPA set at 89 that is just right before mecanical bind of suspension parts. Backed EPA off to 45 no where near full lock maybe half way same thing. Even set the droop screws to the arms was flat no droop at all in the arms same thing. Not going to worry about it just going to pond it off on someone real cheap and go a different rought. Should have none better in the first place. Last edited by Jeff Clark; 10-01-2015 at 05:35 AM. Is it a T48.3? I read the real cheap part. Don't give up quite yet. Can you post a video on youtube and include a link to it here? I've never tried what you did, but once I get mine back together, I'll try it - hopefully 2nite. No it is a brand new nt48 and i just ordered a m2c chassis and was going to buy all the .3 parts and put on it. Done did the brake up grade. Got 2 nice custom painted bodies. I wanted a nice truck when i was finished it but i am not going to spend another dime on this thing just going to take my loss like a man and move on. No dought this is probably a tough truck and handles great dont know never even ran it other than in the yard 1 time and on the starter box. The tires may just be severely out of balance causing the vibration. I suggest you run the truck and enjoy it. Can you try removing the front wheels and trying to apply throttle on the starter box? This will show if this is a drivetrain problem. Let us know. I suggest you run the truck and enjoy it. 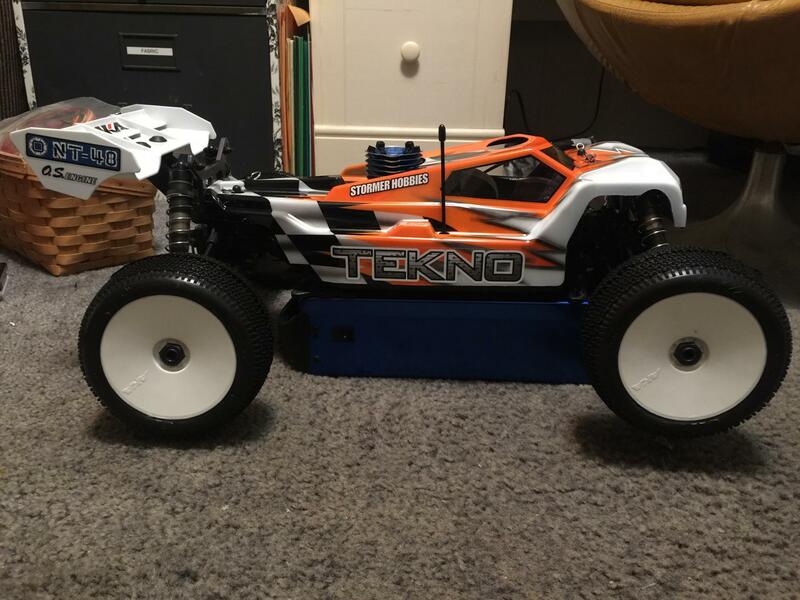 Can you try removing the front wheels and trying to apply throttle on the starter box? This will show if this is a drivetrain problem. Let us know. [/QUOTE Maybe tekno can post the video on the forum that i sent them. I am sure they can do it and explain to people this is normal like the Owner told the customer service rep to tell me. I am sure they would not sell many trucks. If i can get the vid on here it will be posted so the ones wanting to buy one will know they can expect this possibly if they purchase one. I am no pro and i could have mad a mistake some where that is why i contacted tekno and for them just to tell me it is normal don't cut it. If this problem is normal i don't need one. None of the rest of my cars do anything like this and i have quite a few cars all built by me. I will post your video in a couple of moments, by the way I am the customer service rep you spoke to. Last edited by ZERTA RACING; 10-01-2015 at 12:31 PM. Sorry to hear you're so upset. The chatter in the video you sent us is considered normal. The truck is brand new, never been run so the drivetrain has had no time to break in and settle. The tolerances on the parts can produce tight spots that wear in with a few runs. The conditions under which this occurs aren't usually experienced while actually running the vehicle (full droop, full lock, full throttle for an extended period of time). It's unfortunate that you have refused to even run the truggy to see if it wears in. In either case, on a vehicle with as much steering throw as we have allowed, utilizing CVA's at full lock will eventually create some chatter. This is why we have stated that it is normal. On the track you wouldn't even notice because the parts would be loaded. We're confident in the quality of our products as anyone here will attest. The truck took a respectable 2nd place at the Nationals this year in addition to countless other victories around the country and around the world. To dismiss the entire vehicle before ever running it, even after we have tried in earnest to help you is really unfortunate . But it's your choice. We hope you can get past this incident and enjoy your new truggy. Good luck. Jeff this summer I traveled all around the US racing. The common theme among racers is " having a NT48 is like cheating". It is that good. Drive it, you will not be dissappointed. Jeff, it is very difficult to judge a vehicle on the box, especially when it hasn't had track time to break in and seat the parts. Looking at the video it appears the steering throw could be maxing out the travel in the CVDs. This typically does not happen on the track with a load. Also it appears your servo or the linkage in the steering has to much play. This is apparent several places in the video, especially when you hit the brakes abruptly as the wheels shake left to right. steering play along with the truck wobbling on the box seems to be causing the movement to resonate at a certain speed. We can arrange to have a team driver work with you on the issue after the truck has had track time to break in and seat the parts. Please PM me if you are interested. Now that is customer service ^^^^^^ !! Take them up on the offer Jeff! A second set of eyes can sometimes see something that is not right quickly. I've looked a car for hours and have not noticed what was wrong. Then when someone else looks at it my and mistake sticks out like a sore thumb If something is defective, there is no doubt they'll take care of it. Last edited by Brett C; 10-01-2015 at 03:06 PM. All times are GMT -7. It is currently 01:18 AM.